All of the milkweeds are excellent butterfly nectar plants and also serve as the sole food source for Monarch caterpillars. 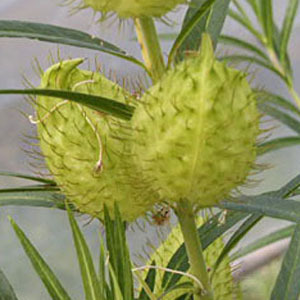 This is a woody South African milkweed, with narrow leaves and creamy white flowers. The inflated seed pods are nice in dried floral designs. Though native to Africa, Monarch butterflies will readily lay their eggs on it. A great fast growing host plant for their caterpillars. Categories: All Items, all potted plants, butterfly nectar plants, caterpillar plants, deer resistant, dried flowers, milkweed plants, Potted Plants, More..